The SPONSORS section provides a dedicated display to recognise your organisation’s sponsors and supporters. When this function is turned on, the sponsors’ thumbnail images can be seen in the main navigation menu as well as on the homepage as scrolling images. Click on SPONSORS in the left side menu and a dropdown will appear with Options, Sponsor Types and Sponsors. Select OPTIONS then the EDIT button. Under DISPLAY MENU select YES. Enter a TITLE for your page, e.g. ‘sponsors’ or ‘suppliers’. If you are going to use SPONSOR TYPES you can click YES. If you are going to use sponsor types, the next step is to click SPONSOR TYPES in the left side menu. Sponsor types allow you to categorise your sponsors, e.g. Gold, Silver and Bronze. If you would like to do this click ADD, enter the TITLE of the sponsor type and enter a number to establish the order that they display in, e.g. Gold would be 1, Silver would be 2. 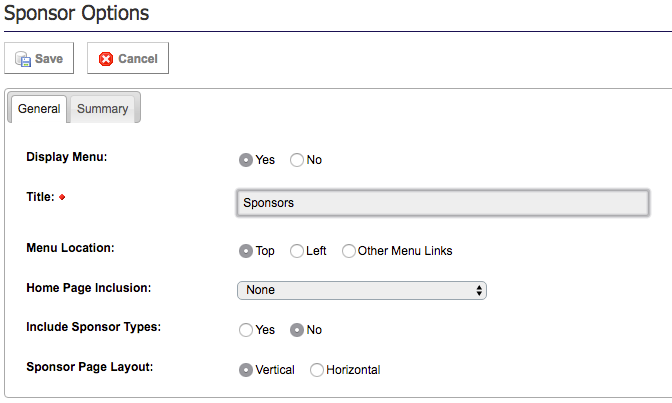 To set these sponsor types live, click again on SPONSOR TYPES in the left hand menu and set the STATUS to a GREEN TICK. To add the individual sponsors click on SPONSORS in the left hand menu. Click the ADD button. If you created SPONSOR TYPES, select the category from the drop down box. If not, just leave it as it is. Enter a NAME for the sponsor and add a brief summary if you would like to write something about them. If you add your sponsor’s URL under WEBSITE, the user will have the ability to click on the sponsor and be taken to their site. You can set the order that the sponsors appear by typing a number in the ORDER box, e.g. 1, 2, 3. You can also need add a Sponsor logo in the Files > Thumbnail Image section. Once you have finished adding sponsors, click SAVE to finish. Then click SPONSORS again on the left hand menu and set each STATUS to a GREEN TICK to set them live.